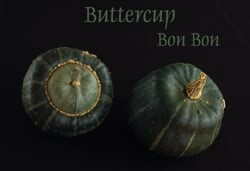 #14 Bon Bon (Cucurbita maxima) Hybrid from the Buttercup family; dark green, slightly flattened fruit (up to approx. 2 kg), dark orange, compact meat. It can be stored for about 3-4 months. 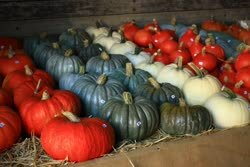 #15 Buen Gusto (Cucurbita maxima) Spanish variety, exceptionally decorative. 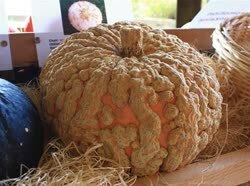 It has a yellow-orange, dry flesh, and the fruit can weigh about 7 kg. It can be stored for 4 to 8 months. #16 Cha Cha (Cucurbita maxima) An American hybrid from the Kabocha family. Round fruits, slightly flattened (up to 2 kg), dark orange and dry flesh. It can be stored for about 3-4 months. #17 Etna (Cucurbita maxima) A new hybrid native to Australia (extremely productive). Gray, round, slightly flattened fruit (weight about 5-6 kg), with distinct 'ribs' ( by the way, I am asking for help regarding professional naming of these 'ribs' in Polish :) ). Flesh slightly sweet, very good quality. You can store from 7 to 12 months. 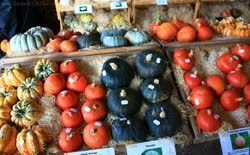 #18 Everest (Cucurbita maxima) Like the above Etna - it is also a new hybrid from Australia, with almost identical characteristics. 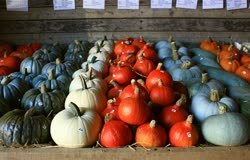 #19 Green Delicious (Cucurbita maxima) American variety, very popular. Fruit in the shape of a heart, dark green (weight from 2 to 5 kg), pulp yellow-orange, dry, with a slightly chestnut flavor. It can be stored for about 5-6 months. 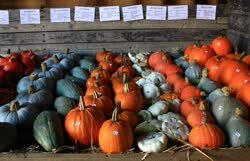 #20 Golden Delicious (Cucurbita maxima) The American variety originated from the Green Delicious and Boston Marrow intersections (existing since 1926). Apparently it is particularly recommended in nutrition for children and infants due to the extremely high content of vitamins. Fruit in the shape of a heart, dark orange (weight from 4 to 8 kg), pulp yellow-orange, dry, compact, slightly chestnut flavor. It can be stored for 4 to 6 months. 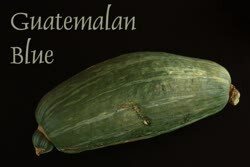 #21 Guatemalan Blue (Cucurbita maxima) 'Banana' pumpkin from Guatemala. Green fruit, slightly 'ribbed', weighing approx. 3-3,5 kg. Flesh yellow-orange, quite dry. You can store approx. 5 months. 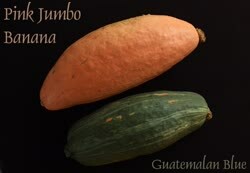 #22 Pink Jumbo Banana (Cucurbita maxima) The fruit can be quite large in size (up to a meter in length), weight from 5 to 20-30 kg (the one in the picture weighs less than 6 kg). 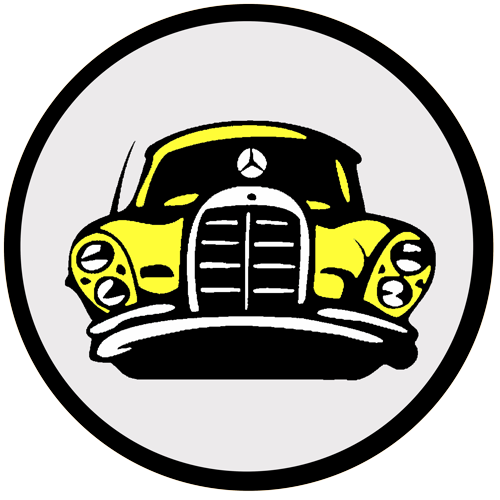 Flesh yellow-orange, quite dry. Can be stored for 5 to 7 months. 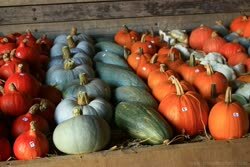 #23 Hayato (Cucurbita moschata) is a Japanese variety that needs a lot of sun and heat, not in every climate, so it grows well. The fruits are quite small (weight to kilogram), the pulp is yellow-orange, slightly sweet (unfortunately it is quite enough ...;)). You can store between 4 and 8 months. 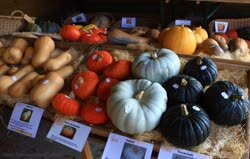 #24 Melonette Jasp�e de Vend�e (Cucurbita pepo) Cream-yellow fruit, similar to melon, slightly roughened skin. Orange pulp with a delicate taste. Frequently used for cakes or preserves. You can store up to 6 months. #25 Moonshine (Cucurbita maxima) A new American hybrid. White-cream fruit, orange flesh of good quality. It can be stored for 4 to 9 months, in optimal conditions up to a year. #26 Moranga Exposi�ao (Cucurbita maxima) Brazilian variety with an original, slightly pink color (orange flesh). Weight up to 5-6 kg. You can store up to 6 months. 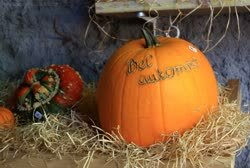 #27 Orange Magic (Cucurbita maxima) Pumpkin from the Hubbard family. Fruits quite small (weight up to 2 - 2.5 kg), orange pulp, quite dry, with nutty flavor. Can be stored for 6 to 8 months. 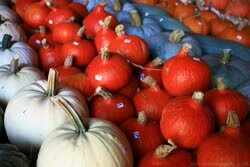 #28 Orangetti (Cucurbita pepo) Pumpkins from the 'macaroni' family, straight from Israel. Orange fruit (weight from 1 to 2 kg), light yellow pulp. You can store up to 6 months. 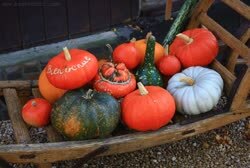 #29 Permanent (Cucurbita maxima) Pumpkin straight from Taiwan. Fruit slightly flattened, weight up to 3 kg. Orange pulp, slightly 'flourish', very good quality. It can be stored for approx. 5-8 months. 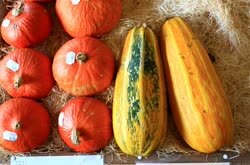 #30 Potiron de Gen�ve (Cucurbita maxima) Pumpkin straight from Geneva, which virtually disappeared from cultivation and only from 2007 it was re-introduced to the market (thanks to KCB-Samen ). Red-orange fruits, round and flattened, pulp yellow-orange, quite dry, with a slightly sweet, fruity taste. You can store up to 8 months. 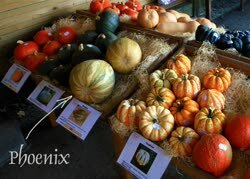 #32 Sweet Berry / Sucrine du Berry (Cucurbita moschata) A French pear-shaped variety. Green-orange fruits weighing 1 to 2 kg, which can be harvested before they are fully ripe (ripen during 'aging'). Flesh yellow-orange, juicy, slightly sweet. You can store up to 7 months or even longer. 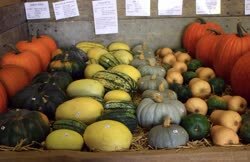 #33 Sweet Meat (Cucurbita maxima) An American variety with a fairly sweet flesh, ideal for desserts and cakes. Fruit weighing 3 to 5 kg, dark orange pulp, quite dry, good quality. You can store up to 9 months. #34 Thunder (Cucurbita maxima) A hybrid from the Kabocha family, very productive. Dark green, round and slightly flattened fruit. Flesh dark yellow, quite dry, with a slightly chestnut flavor. You can store between 4 and 8 months.